In 1935, a Chinese woman by the name of Shi Jianqiao murdered the notorious warlord Sun Chuanfang as he prayed in a Buddhist temple. This riveting work of history examines this well-publicized crime and the highly sensationalized trial of the killer. In a fascinating investigation of the media, political, and judicial records surrounding this cause célèbre, Eugenia Lean shows how Shi Jianqiao planned not only to avenge the death of her father, but also to attract media attention and galvanize public support. 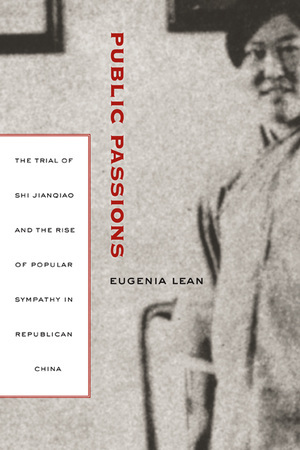 Lean traces the rise of a new sentiment—"public sympathy"—in early twentieth-century China, a sentiment that ultimately served to exonerate the assassin. The book sheds new light on the political significance of emotions, the powerful influence of sensational media, modern law in China, and the gendered nature of modernity. Eugenia Lean is Assistant Professor of History at Columbia University.